The book, named 'The Postman' was published in 1929. SILVER SPRING, Md. — A Maryland library has finally received one of its overdue books – 73 years later. Montgomery County Public Libraries (MCPL) received "The Postman" in the mail last Monday. The children's book, which describes how the Postal Service works, was taken out from the old Silver Spring library in 1946. "We get things back from the '60s or '70s, but not ever anything that was taken out in 1946," said Anita Vassallo, acting director of the Montgomery County Public Libraries Administration. Mora Gregg, of Toronto, Canada, mailed the book back to Montgomery County after working to make space for new books in her home. 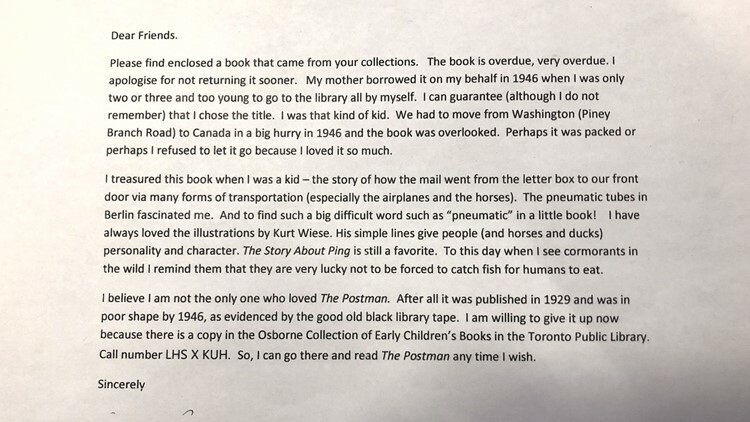 In a letter to MCPL, Gregg, a former librarian, wrote that her mother borrowed the book on her behalf when she was either two or three. Mora Gregg returned 'The Postman' to Montgomery County Public Libraries more than 73 years later with a letter attached to the package. "And, then, we moved to Canada and the book got packed or something," Gregg said. "Either that or I wouldn't let it go." While "The Postman" is still bound together at its spine, its pages have worn with age. The book was originally published in 1929. Vassallo said MCPL is considering mounting it in one of its branches for visitors to see the fragile work. As for whether Gregg could expect a fine, Vassallo said she has no reason to worry: MCPL does not charge late fees for overdue children books. "This is the kind of thing that makes you smile," said Vassallo of the returned book. "It warms your heart."